Note: *Available years before 2001. Sources: CICH graphic created using data adapted from the following sources: 1983 to 1997- Statistics Canada. Canadian Vital Statistics. Excluding Ontario and Newfoundland in CICH Profile 2000; 2001 to 2010- Public Health Agency of Canada. Perinatal Health Indicators for Canada 2013: A Report of the Canadian Perinatal Surveillance System. Ottawa, 2013 using Statistics Canada, Vital Statistics. Notes: Data from Ontario were excluded because of data quality concerns. Excludes live births with unknown gestational age; 2011 to 2014; and, Discharge Abstract Database (DAD) Hospital Morbidity Database (HMDB), Canadian Institute for Health Information; and Fichier des hospitalisations MED-ECHO, ministere de la Sante et des Services sociaux du Quebec. https://apps.cihi.ca/mstrapp/asp/Main.aspx?Server=apmstrextprd_i&project=Quick%20Stats&uid=pce_pub_en&pwd=&evt=2048001&visualizationMode=0&documentID=029DB170438205AEBCC75B8673CCE822 -accessed June 24, 2017. 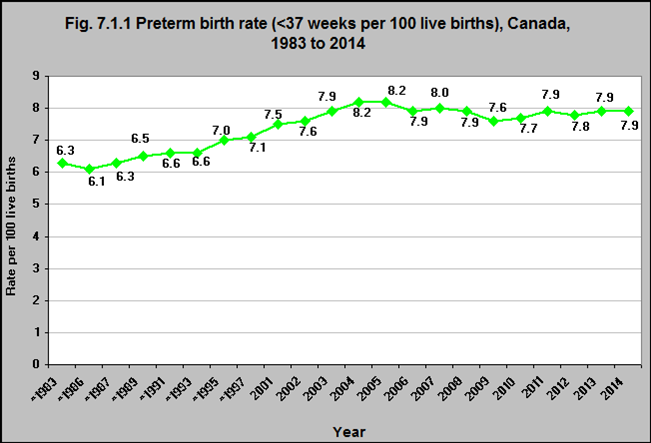 In 2014, the preterm birth rate in Canada was 7.8%. This rate has been stable since the mid-2000’s. Prior to that it increased from 6.3 in 1983. Babies who are born preterm are at higher risk of many negative health outcomes. These include problems with the respiratory system such as respiratory distress syndrome and chronic lung disease; heart problems; hearing and vision problems; a compromised immune system and gastrointestinal problems. They are at a higher risk of dying. Preterm infants have a high rate of neurological problems – including cerebral palsy, developmental delay, learning disabilities, attention deficit-hyperactivity disorder, behavioural problems and social and emotional challenges. Babies who are born too early require access to services such as neonatal intensive care, follow-up programs and early intervention programs to address neurological deficits.1Provinces and territories need to have programs and services in place to support babies who are born preterm. 1Institute of Medicine (US) Committee on Understanding Premature Birth and Assuring Healthy Outcomes; Behrman RE, Butler AS, editors. Preterm Birth: Causes, Consequences, and Prevention. Washington (DC): National Academies Press (US); 2007. https://www.ncbi.nlm.nih.gov/books/NBK11362/ -accessed August 31, 2017.